Social media has taken a great leap forward in the recent years. Websites like Facebook, Twitter, My Space, Linkedin, Classmates, Orkut etc have become an integral part of our life.The concept of 'tweets' and 'likes' are being taught in management schools. In short, people have found a good friend in these so called social media websites. These websites are an effective medium for advertising and companies are using these sites to generate awareness about their brands and services. Social Media are a set of technologies that work as a platform for the user to share his or her thoughts in a more effective manner. Social Media integrates individuals, their friends, like minded communities together and provides them a space to share their views. Social media is not limited to one platform, it may use any platform to reach the audience. In essence, Social Media combines communication, text, images, videos together and presents it before the audience. SMO stands for Social Media Optimization. These are a set of techniques which increases your website's presence in the social media websites. It encourages people to spread the buzz about your company,brand,product or services and makes it popular. 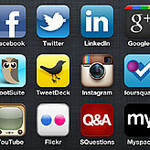 Social Media are a set of technologies that promotes the growth of social networks. On the other hand, social networks are groups or communities consisting of real world people who share a common view or passion with the help of those networks. Classmates etc. Chill n read etc. How to optimize your business website for social media? Create a complete profile of your brand or company on the targeted social media website. Join like minded social networks and share useful stuff with them. Share some interesting news and try to integrate your brand with it. Follow the social media etiquettes. Include url’s to your website when sharing information with your audience. Increase your social sphere. Have more likes in your facebook page, more followers on twitter profile etc.